Configure server-wide SAML when you want all single sign-on (SSO) users on Tableau Server to authenticate through a single SAML identity provider (IdP), or as the first step to configuring site-specific SAML in a multi-site environment. If you have configured server-wide SAML and are ready to configure a site, see Configure Site-Specific SAML. You are familiar with the options for configuring SAML authentication on Tableau Server, as described in the SAML. You have verified that your environment meets the SAML Requirements, and obtained the SAML certificate files described in those requirements. To configure SAML for Tableau Server, you complete the following sets of steps. Put certificate and IdP metadata files in place — This section includes information for configuring SAML for a Tableau Server cluster. Choose the SAML configuration method — Here you can get the steps for the configuration method you’re most comfortable with: Tableau Services Manager (TSM) web UI, TSM CLI, or samlSettings entity with JSON file. Generate Tableau Server metadata and configure the IdP — Add Tableau Server as a Service Provider. Test the configuration — Sign in to the Tableau Server web UI. Copies of the SAML certificate and key files. To review the certificate file requirements again, see SAML Requirements. If you want to configure SAML using the TSM CLI or samlSettings entity, you also will obtain the IdP’s metadata XML file. If you plan to Configure SAML Using the TSM Web UI, you will get IdP metadata when you go through the steps in the UI. Note: If you use the same certificate files for SSL, you could alternatively use the existing certificate location for configuring SAML, and add the IdP metadata file to that directory when you download it later in this procedure. For more information, see About the certificate and key files in the SAML requirements. If you plan to configure SAML in the TSM web UI, skip this step. You will complete it as you go through the UI steps. If you plan to configure SAML using the TSM CLI or TSM samlSettings entity, go to the IdP’s website or application, and export the IdP’s metadata XML file. Repeat the earlier step to create a directory for the SAML certificate and key files (or use the existing certificate location if you use the same certificate files for SSL). Copy the certificate, key, and IdP metadata file from the initial node’s saml directory to the same location on the subsequent nodes. After you copy the files to the subsequent nodes, you do not need to do any additional configuration on those nodes. Use the Tableau Services Manager (TSM) web interface: From this point forward you can leave this article and use the steps provided in Configure SAML Using the TSM Web UI. The SAML template shows the minimum required keys for enabling server-wide SAML. You will need to replace the placeholder values for returnUrl, entityId, certFile, keyFile, idpMetadataFile, and idpUsernameAttribute. The passphrase will be encrypted and saved. See Manage Server Secrets. To learn more, see samlSettings Entity. Using the location you created if you followed the steps in Put certificate and IdP metadata files in place, and including all parameters that are required for initial configuration, configure the SAML settings for the server (replacing placeholder values with your environment path and file names). tsm authentication saml configure --idp-entity-id https://tableau-server --idp-metadata "C:\Program Files\Tableau\Tableau Server\SAML\<metadata-file.xml>" --idp-return-url https://tableau-server --cert-file "C:\Program Files\Tableau\Tableau Server\SAML\<file.crt>" --key-file "C:\Program Files\Tableau\Tableau Server\SAML\<file.key>"
Run the following command to generate the required XML metadata file for Tableau server. You can specify a file name, or omit the -f parameter to create a default file named samlmetadata.xml. Add Tableau Server as a Service Provider. Refer to your IdP’s documentation for information about how to do this. As part of the process of configuring Tableau Server as a Service Provider, you will import the Tableau Server metadata file you generated from the export-metadata command. Confirm that your IdP uses username as the attribute to verify users. In your web browser, open a new page or tab, and enter the Tableau Server URL. The browser redirects you to the IdP’s sign-in form. 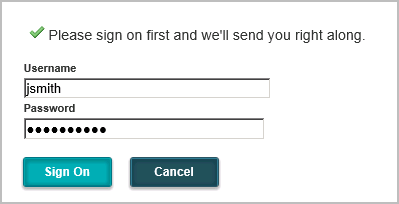 Enter your single sign-on user name and password. The IdP verifies your credentials and redirects you back to your Tableau Server start page.